"I choose this hotel every time my visit to KK, it's good and..."
Have a question for In Hotel? "Good view from high floors." "Staff is helpful and will return again." Ideal for fun and relaxation, In Hotel is located in the Central Business District area of Kota Kinabalu. From here, guests can enjoy easy access to all that the lively city has to offer. With its convenient location, the hotel offers easy access to the city's must-see destinations. The facilities and services provided by In Hotel ensure a pleasant stay for guests. The hotel provides free Wi-Fi in all rooms, 24-hour security, daily housekeeping, 24-hour front desk, facilities for disabled guests to ensure our guests the greatest comfort. Experience high quality room facilities during your stay here. Some rooms include television LCD/plasma screen, internet access – wireless (complimentary), non smoking rooms, air conditioning, desk, provided to help guests recharge after a long day. Besides, the hotel's host of recreational offerings ensures you have plenty to do during your stay. With an ideal location and facilities to match, In Hotel hits the spot in many ways. "Will stay here again next time." Air conditioner leaking beside the bed ，and the fan too noisy .trying call front desk but The telephone line is not installed, just for display.......at last got technician came to clean the air conditioning , (I think this maintenance have to check before a guest to stay) thank you sir . overall the hotel is satisfying. interior design is simple and modern..facilities is new.. bed is big and room is not so spacious but at least its clean and the furniture is good. the only thing is they only have 5 parking lots. maybe the hotel is still growing and will have more parking lots soon. Clean and new hotel which is great to stay but the location is not near the town. I would have recommend this hotel to those travelers who travel by vehicle. Everything in the hotel was great and fine-decorated room design. Facilities all functioned well such as air-con, lighting, and water heater. 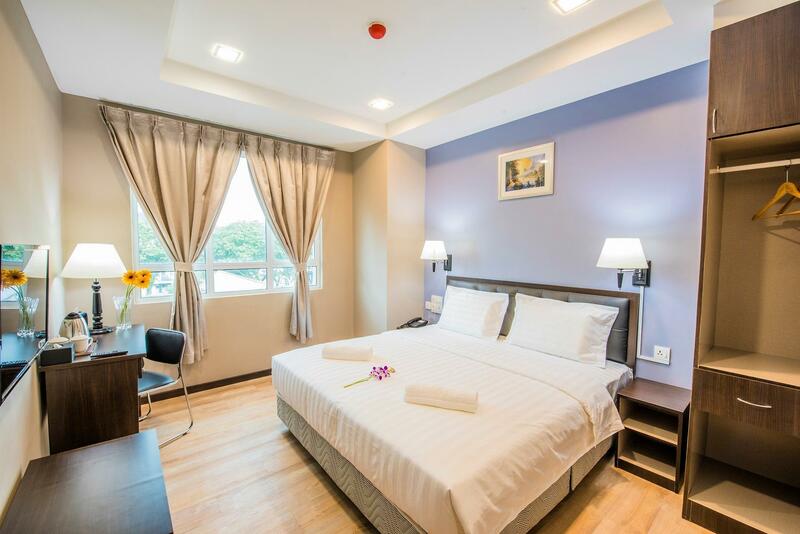 As title, the hotel is 10km away from the centre of KK, but is a nice hotel with all things you need from a hotel. 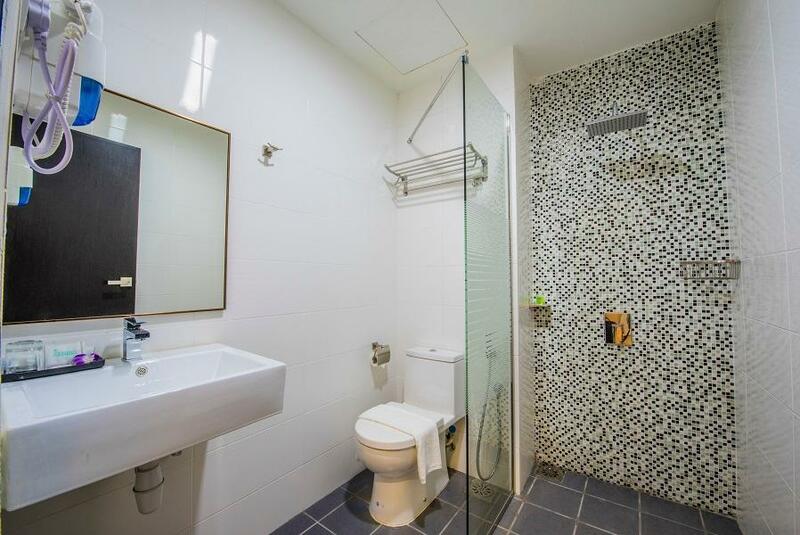 Nice shower with strong water pressure, big and comfortable bed, cover parking(only few). 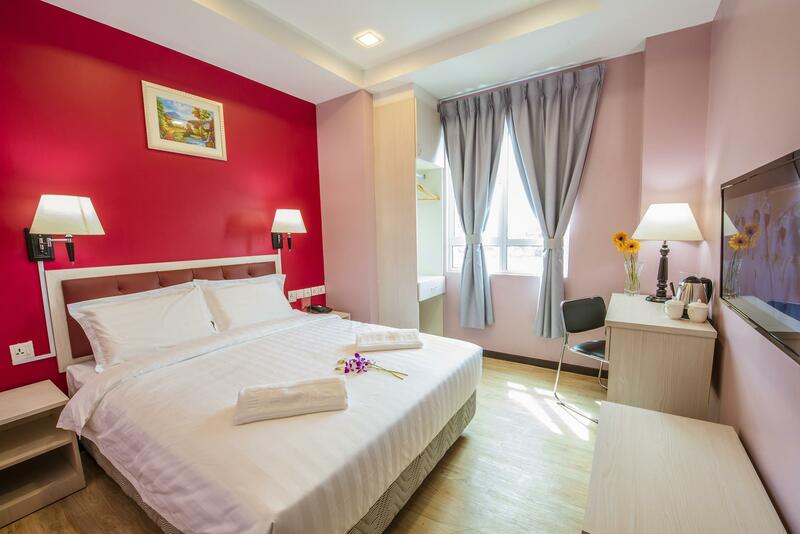 As like title, room rate is worthy, hotel is provided with limited car parking (first come first serve basis), cold aircond, clean and comfy bedroom. i was on trip with two of my friends. This is a new hotel and took two nights stayed. Room is clean, the towel is clean too but the room is quite small. you might have trouble to find parking on daylight as there is construction next to the hotel and surrounded by other shops. but easily to park on midnight. It tooks somewhere around 10-15 minutes to the city as it would depend on the traffic. we chosed this place even its a bit far from the city because its a new hotel and you wont easily get cheap hotel and great facilities in city. most of the hotels in the city are quite old. so yeah, we will definitely come back to this hotel. Overall the room is great; great lightings, comfy bed, spacious... The only thing that I dislike is the management will turn off the water heater during midnight(I guess?) so when in morning want to shower , have to ask their management whether is their water heater is on. Had hair dryer,coffee maker. Will stay here again next time. Spacious and clean bedroom,toilet also. Everything is ok. Had parking space in front of hotel lobby. Overall,very good. Good clean hotel, a real value for money. Only a bit far from KK Town. Stayed for a night to catch up an earlier flight. Bed is comfortable, toilet is clean and water heater is hot enough. Just room space is a little bit too small. But its no harm. Will come back in the future. I was happy that i chose this hotel to stay in during our trip to KK this time. it's a new hotel and the rooms are all so clean and well mantained. Even the staffs are friendly and polite. The only downside is there is not much parking. However there are open parkings in front of the hotel but during weekdays you will definitely need to use the parking coupons. We were so pleased with our stay here that we even extended for another 3 nights after we're back from Kundasang and Ranau. TV did not have English channel. Room is not really sound prove, able to hear the TV volume from the next room and hear people talking and walking. Aircon was dusty and needs to be cleaned. There were mosquitos in the room. But overall a reasonably priced hotel for short stay. The actual distance is alright on the map, but when coupled with the perpetual traffic, it was easily a 35 - 40 minute journey from the main city to the hotel. Pros: Cleaned every day, air cond was cold, shower area was sufficient, Grab-friendly, staff are polite. Cons: Too far from the main city, not possible to walk to any main attractions so either you rent a car or use Grab a lot, construction going on at the adjoining lot so construction work started early into the morning, only five parking lots available with one disabled car park. Overall, it was reasonably priced for the simple facilities available but if you have main activities in the city, it'd be better to stay nearer to the city. The 1st day i come i was welcome by cockroach on room 501. the staff just ask the person to kill the cokcroach. not change the room. i was so piss off. luckly the lady on the night shift change our room but not the lady on the morning shift. i don't want anymore to live in this hotel. I was actually recommended from a friend about this hotel and it is not disappointing. The place is comfy and clean, staffs are helpful and i really had enough of a good night rest. Since i reached the hotel quite late at night, its a bit difficult for me to look for foods around as it located near industrial areas. But during daytime, there are actually restaurants and a town market right at the corner. Overall, I actually enjoy the stay here. Have to go through heavy traffic jammed everytime.